We have a short-notice opportunity coming up on Wed, Dec. 10th to hear about the possibilities of gaming in libraries and the gamification of information literacy. The chapter presents a model of game experiences that he developed in order to bring together games of all types. Instead of focusing on a game platform, it focuses on the experiences players have in the game. Scott is coming to Singapore to do workshops on gamification with Singapore government entities -- and has time to come and talk to us (and have dinner afterwards, with any who are free) on Dec 10th. 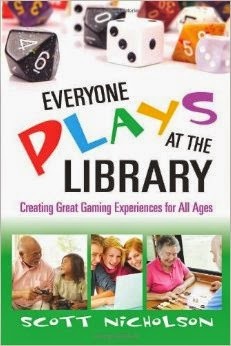 I attended one of Scott's workshops on gaming in libraries at the annual ALA (American Library Association) conferences two years ago -- and it was very enlightening -- not to mention fun! Linda Twitchett has offered her Senior Library at the Australian School as a venue -- 5:00 for a 5:30 pm start. If you are interested, please let us know via this Google Form (to know the right amount of wine and snacks). NOTE: Feel free to bring others along. They don't have to be librarians. While the talk will be aimed at gaming in libraries, Scott is an expert on gaming in general. Other committee members are encouraged to write their own assessment of titles and the process -- which can be posted here. Looking ahead, I've set up four Goodreads lists for collecting titles to consider for next year. Please feel free to add whatever. 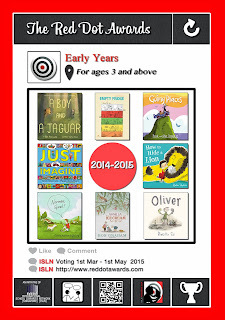 Thanks to my very creative library assistant, Ernie, here are some posters for the four categories of the Red Dots, plus some shortlist stickers. Go to the Red Dot Promotional Materials page to find them. And if anyone makes any posters or promotional materials of their own, please let us know -- and I'll put them up on the Red Dot website. The more, the merrier. Our Regional PD page just got some updates. You can go to KL in January and brush up on your Destiny knowledge (with Jenna Emerson & co), as well as see the famous Kevin Hennah. Or you stay home and attend a conference on creativity and children's literature. Our own SAS is hosting four fabulous creators -- Candace Fleming & Susan Campbell Bartoletti, both known for their upper primary/middle school narrative non-fiction, and Eric Rohman & Todd Parr, authors and illustrators for the younger end. Then in early February you can go to Bangkok to hear Bob Stein, director of the utterly fascinating Institute for the Future of the Book and a specialist in electronic publishing, especially in the realm of education, at the Librarians Knowledge Sharing Workshop & Job-Alike. Though that same weekend our campus, UWCSEA East is holding weekend workshops with book-loving consultants Penny Kittle and Dan Feigelson. 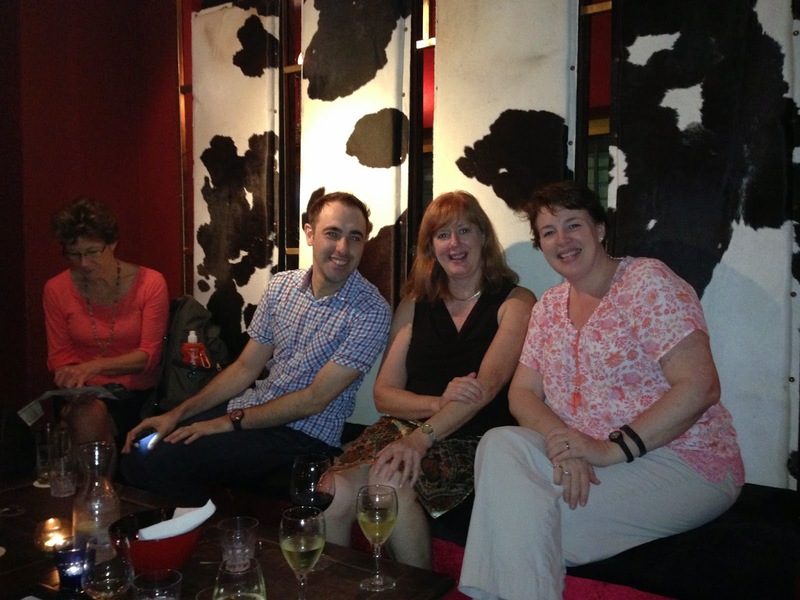 Barb, Nadine, and I will be missing the next network meeting as we are off that afternoon to Hong Kong for the School Librarian Connection Fri/Sat conference, which looks to be great fun. Is anyone planning to go to Hong Kong for the December 21st Century Learning conference? At last! After a lot of reading and online discussion, we have some shortlists. If anyone knows a book here and feels it is misplaced or misguided, please shout out right now. Last chance to make another suggestion! If I don't hear any complaints by Tuesday, I will update the reddotawards.com website -- for the world to see. As the process took longer than we'd hoped, the committee would like to propose that VOTING be extended this year (every year?). We usually have it open for one week in early March, after which schools know their own voting results and we publish a country-wide tally. The Readers Cup list is usually announced shortly thereafter, whereby 4-6 of the 8 shortlist titles are chosen for the students to study and compete on. 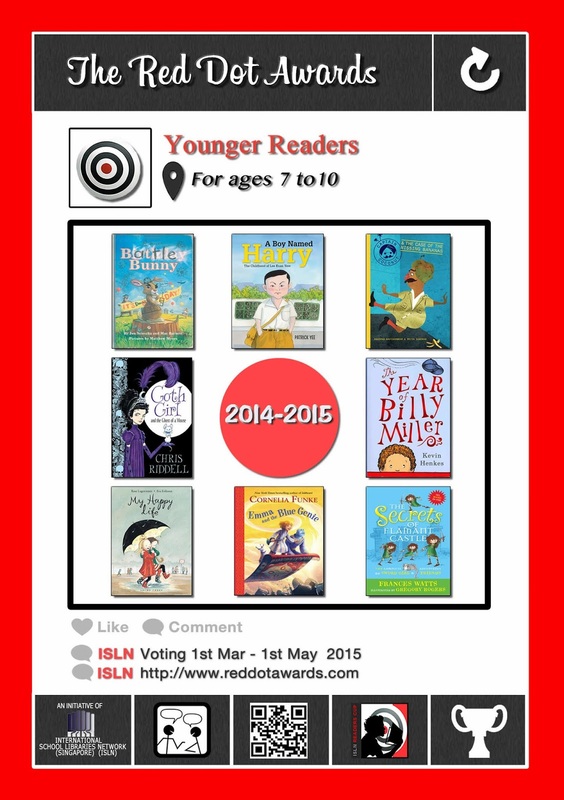 In 2015 we suggest the Red Dot voting run from 1 March to 1 May -- so schools can vote at their convenience -- and the Singapore overall winners will be announced on May 3. 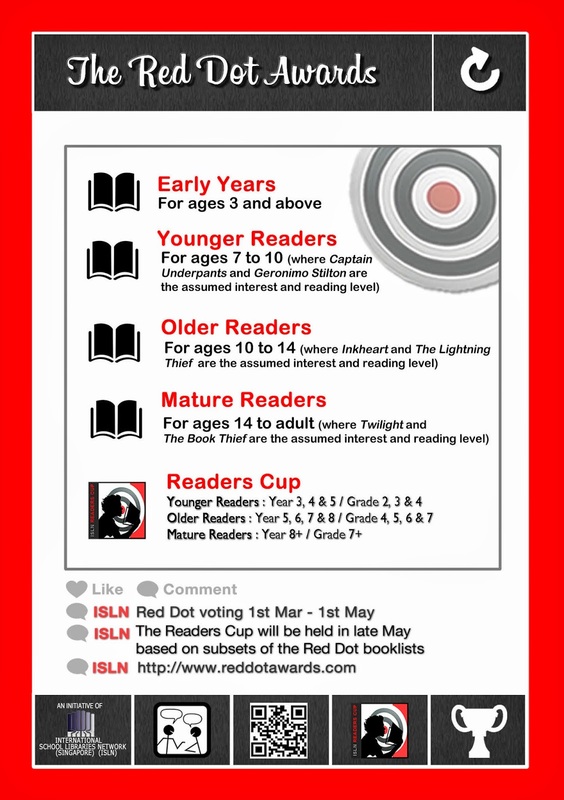 We also suggest that the Readers Cup committee announce their subsets of the Red Dot shortlists earlier, e.g., Dec. 1st. We also intend to shift our timing to announce the NEXT shortlist on June 1st every year, from now on. The longlist for next year has already been started, thanks to so many great titles considered for this year. If anyone has any comments on these changes or would like to be on next year's committee, please let us know either in the Comments to this blog post or directly to the Executive Committee by emailing librarynetwork@gmail.com. Tonight is our monthly social (6pm onwards). The venue -- appropriately called "The Library" -- is a new one for us. And it does sound interesting. A review of it on TimeOut Singapore says you need a password to swing the bookshelves open -- to reveal a dimly lit bar with playful cocktails! I can't attend, but look forward to hearing how it is. Next Thursday there's another opportunity for us to get together -- in a bigger group -- for digital learning at the Teach-Meet, Thursday, Oct. 9th at Zsofi Tapas Bar, 68 Dunlop Street (Little India) -- 5:30 to 8:00 pm. Go to 21c-learning.com/sg-teachmeet/ to register -- especially if you want to present. The format is a series of Nano-presentations lasting 2 mins or Micro-presentations lasting 7 mins -- by local/international teachers. Next time maybe I'll get around to signing up to present something. This time I'll sit back and enjoy. 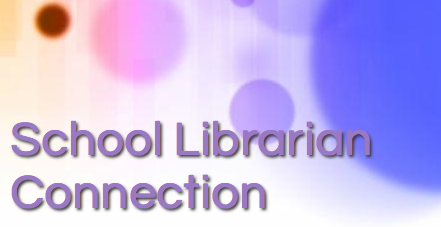 Fri-Sat, November 21-22 is a two-day School Librarian Connection collaborative initiative in Hong Kong, which I'm helping Dianne McKenzie organize. As for the Teach-Meets, you can choose the mode and duration of whatever you want to share, if anything. Mini, macro, nano, or even just a digital post presentation. Click here to see the programme so far. It's reasonably priced at SGD$130. And less if you only want to attend one day. As promised, relatively easy instructions on how to join our private Google Group -- in order to receive notices of upcoming meetings, agendas, queries, etc. As always, don't hesitate to let us know if this is not helpful or accurate! Last weekend there was an International Baccalaureate (IBO) Continuum workshop on libraries held at Tanglin Trust School, led by Dianne McKenzie and Gary Green -- which several ISLN members attended. You can see the IBO - Asia Pacific workshop planning calendar here -- to look for future ones. NB: my IB coordinator, Guy Roberts, says there will be a big regional IB job-alike on a Saturday in May at our campus, and we will definitely have a librarian strand. Coming up soon, there is the annual Google Apps for Education Summit held at the Singapore American School. This year it is on the weekend of September 6th and 7th. See website here. The cost is approximately S $375 and it's a wonderful chance to catch up on developments in the Google Apps world -- and general digital literacy. Barb Reid and I are attending from UWCSEA East -- and I expect to see a few others there as well. At the end of September, Barb and I are traveling to Queensland, Australia, for the first International Library Symposium, held in conjunction with SLAQ. Learning 2.0 this year is being held October 2-4 at the New International School of Thailand (NIST) in Bangkok. Doug Johnson of Blue Skunk blog is one of the presenters -- and libraries are one of his specialties. On November 21-22 [!!!! moved a week later from originally announced Nov. 14-15] (a Fri/Sat) in Hong Kong there's the School Librarian Connection, a two-day collaborative initiative. Participants can share their expertise on a hot topic in a variety of ways: Mini presentation (20 min), Micro (10 min), Nano (3-5 min), or simply via a Digital Post (a link to a slideshow or video). 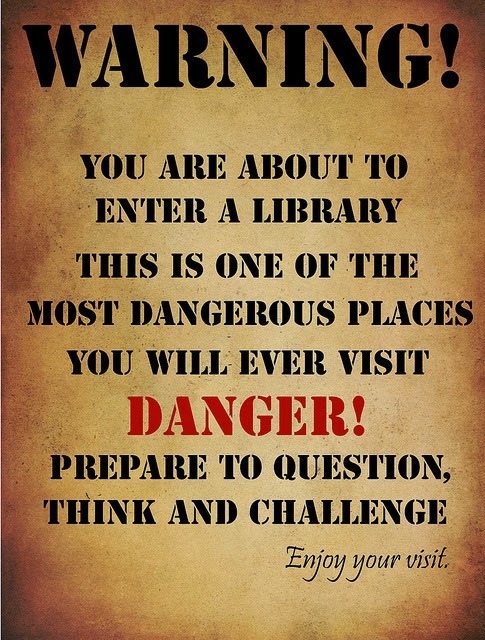 Anyone going over from Singapore should consider touring some international school libraries while there. Also in Hong Kong, on December 11-13, is the 7th annual 21st Century Learning Conference, which always has a good number of library and research-related workshop offerings. On February 6-7, there will be the 3rd annual Librarians Knowledge Sharing Workshop (LKSW) in Bangkok, hosted by Kim Beeman at Shrewsbury International School. Click here to register your interest via a Google Form. See last year's LKSW website here. Added 24-Aug-14: Watch for the regular Singapore Teach-Meets -- held at Lowercase, a cafe/bar Lasalle College of the Arts -- the next one is October 9th, 5:30-8pm. If anyone knows of any regional PD that should be added to our blog page -- see REGIONAL PD here -- please let me know and I will add the details. Those of us on the northern hemisphere academic schedule are slowly starting up again after the long break. We look forward to seeing each other at our upcoming meeting, Wednesday, Sept. 10th in the Primary Library at the German European School (GESS), 300 Jalan Jurong Kechil, Singapore, 598668 -- 4:00 pm for a 4:30 pm start. An agenda will be forthcoming, via the Google Group. Ranita Smart, our host, says while parking is available, no one is allowed to drive into the campus between 4:00-4:20 pm, as the school buses leave at that time -- so plan to arrive before or after that 20-minute window, if you are driving. There should be several new faces in the crowd. Not only do we have a few new schools (e.g., GEMS World Academy and Dulwich College), but also the replacements of our former colleagues, e.g., at the Canadian school (Lisa and Isabel), the German school (Ruth), Eton House (Carla), OFS (Jeroen), UWCSEA East (Debbie), SAS (John Johnson), etc. NB: New school librarians in Singapore: you as an individual are free to attend our general meetings. Just come along. The benefits of having your school join as a paying member are outlined here -- and relate to professional development opportunities that we provide. We do recommend you join our Google Group in order to receive email updates re meetings and blog updates. The only requirement is that you sign up with a valid Google Account email. 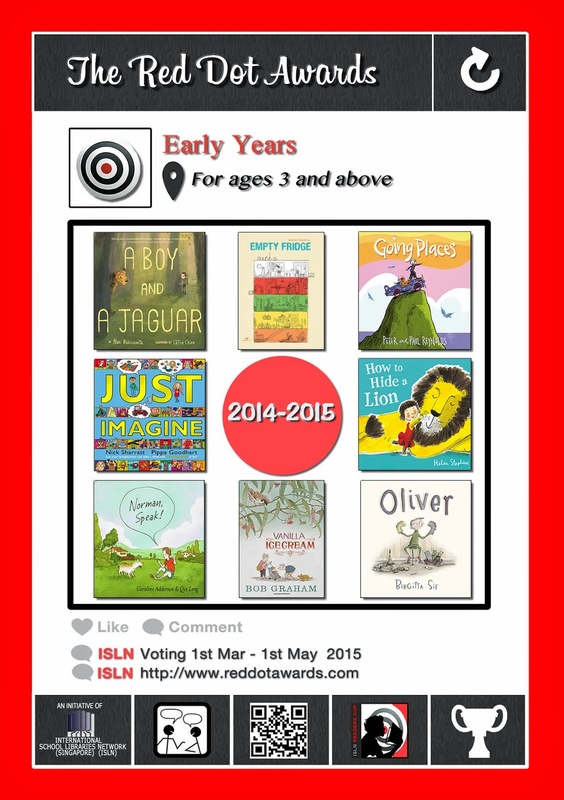 Re Red Dots: New people should read the write-up I did of the history and evolution of the Red Dot Book Awards (here). All schools are encouraged to participate every year. And all ISLN members are welcome to be on the committee which sets the 8 titles for each of the 4 categories of readers. 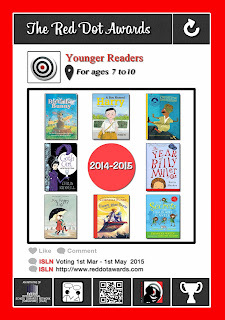 Read the May blog post on the longlists here. I notice that only 3 of us have signed up to be on the Red Dot committee so far. Link to Google Doc here. I'm going to consider this document open for the next week -- and then we will try to settle subcommittee meeting times for Early/Young Readers and Older/Mature Readers before the Sept. 10th meeting. We have to get going on it. 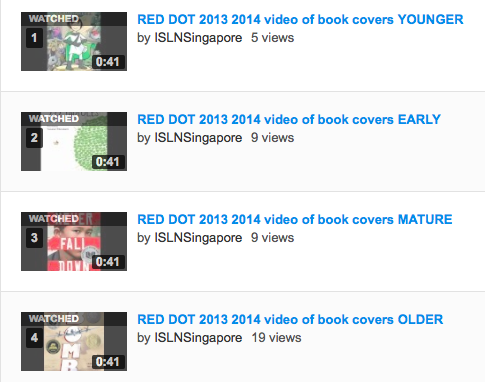 The goal is to announce the sets of Red Dot titles by the end of September -- and it's always a stretch, time-wise. October is a no-go month for our network -- because of differing holiday schedules -- so sometimes we don't manage it until the end of October. Yet we know schools need to be ordering the books -- as the voting takes place in early March. 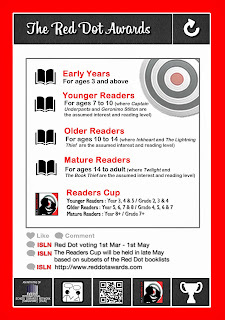 The Readers Cup competition (which is based on a subset of the Red Dot titles) takes place in late May. We will be asking for a new committee to organize this at the Sept. 10th general meeting. After last year's event, there were several discussions about how to improve it -- both in content and organization. I feel if we are going to introduce changes, people need to know by our November meeting. So if you are interested in the organization of the Readers Cup, be prepared to raise your hand in September! Looking forward to seeing you all on Sept. 10th -- and to seeing my Red Dot Committee spreadsheet fill up a bit. Okay, the Goodreads Listopia lists are still there for the public to add to, but I'm going to suggest that we librarians shift over to LibraryThing for our insider voting -- in order to escape the outsiders who have put some not appropriate books on the list. So this will be a parallel universe of sorts. One of the advantages of the LibraryThing list feature is you can "VOTE DOWN" titles that other people have put on (just in case we get intruders). In Goodreads you can only vote up titles. NB: When you get to these lists in LibraryThing (via the links above) and you are logged into your own LibraryThing account, on the right-hand side, opt to "Add to favourites". That way, when you are on your Home page and click on "Lists" on the left, the Red Dot lists will show up under "Favorites". Remember: only books from 2011, 2012, 2013, or 2014. And if you have any doubt about which category to put it in, put it in two. In the end we only need 8 books per category, but given we have a 4-year window to work with, long lists of good titles will never go to waste. You can use this for your summer reading suggestions! If you don't feel up to dealing with another bibliographic tool, I understand. I will watch the Goodreads Listopia lists and try to keep the two in parallel, but for discussion purposes come August, we'll be looking at the books via LibraryThing. My sincere apologies that in copying books over from Goodreads to LibraryThing, I won't have transferred any comments you might have made as to WHY you chose the book. Most importantly, if anyone is interested in being on the Red Dot Committee, please add your name and relevant information to this Google Doc: CLICK HERE. The commitment means in-person meetings in August and September -- and maybe October (though maybe we will master Google Hangouts better). And lots of reading! The annual Readers Cup competition was well-attended and enjoyed by everyone on Thursday, May 22, at the Canadian International School - Lakeside. This year we experimented with running the three competitions simultaneously, in order to keep the time frame between 4 and 6 pm -- and it worked very well, with everyone together in the auditorium for the opening remarks, and then at the end for the announcement of the winners in each category. Congratulations to the winners -- and to all the participants! Each winning team member in each category received a personal book coupon for $20 and the winning schools in each category received a book coupon worth $1,000 -- all from the sponsor of this event, Bookaburra Books, represented by the owner, Cheryle Hum. In case you're interested, here are the questions and answers used in the three categories -- as well as the Multiple Choice quizzes for each. Many thanks to Lisa Patton, Head of Libraries at Canadian International School - Lakeside, and her colleagues for all their work in hosting the event -- and to all the people who volunteered to be judges. Thanks also to the support of our ISLN network members who participated and ran teams this year. 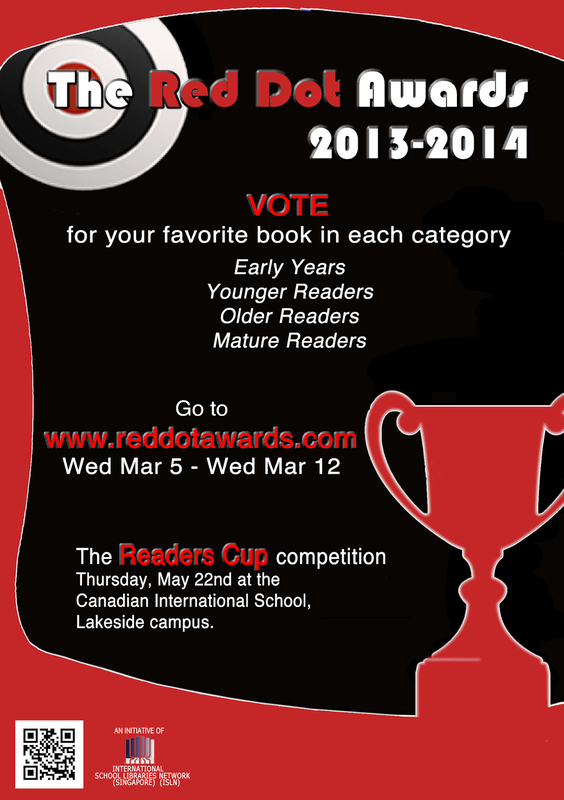 The annual Readers Cup competition will be held Thursday, May 22, at the Canadian International School, Lakeside. Register your teams by Friday, May 16th. More detailed information about the day will then be emailed to you. It's time to start thinking of the next round of Red Dots. 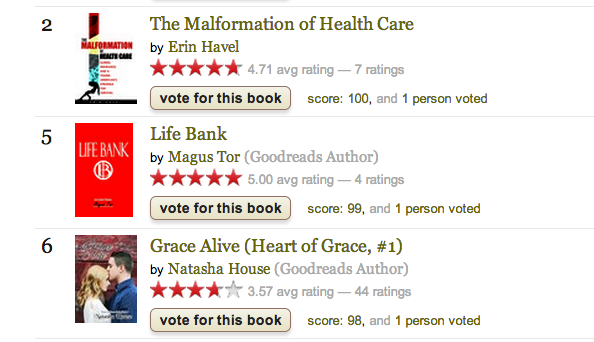 As you think of good potential titles, please put them on these GoodReads Listopia lists. The lists are handy as sources of summer reading suggestions for your students. These GoodReads Listopia lists are open to anyone in the world (with a GoodReads account) to contribute to - and/or vote on. Think of accessibility -- easy to purchase from major vendor? is it available in paperback? Please ignore them. The Red Dot committee surely will. And if anyone has a better idea of how to suggest titles, let me know. 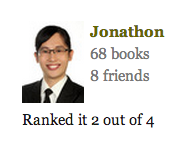 We could just go with the Goodreads group shelf, but it's a bit more of a hassle to put books on a shelf. 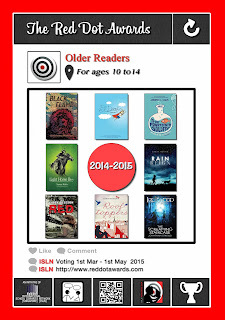 The four SHORT LISTS will be announced by the Red Dot ISLN committee in September. See you all at the Readers Cup competition on May 22nd at CIS Lakeside. I just put up 4 YouTube videos -- just 40 seconds each -- showing the book covers in each category -- in a playlist. Anyway, here is the playlist. I just put up a new poster for advertising Red Dot book voting, March 5-12, on the Red Dot site. You should be able to right-click on it and download. And it should print out fine at A3 size. If not, let me know. Just a reminder, we have two links off the top of this blog related to professional development. A list of organizations that run conferences or offer workshops that may be of interest to our membership, e.g., EARCOS, IASL, LAS, NLB, etc. NB: The workshop by Doug Johnson that was going to be held at UWCSEA East in March has been cancelled. A Google Spreadsheet that anyone can edit to list journals and websites related to children's literature, YA literature, school librarianship, and librarianship -- and how to access them. Please feel free to add your favorites. There is also a page for Supplier Information -- which is a Google Spreadsheet anyone can edit, with tabs for different categories, e.g., furniture, signage, magazines, etc. The Readers Cup competition will be held Thursday, May 22, 2014, at the Canadian International School, Lakeside campus. 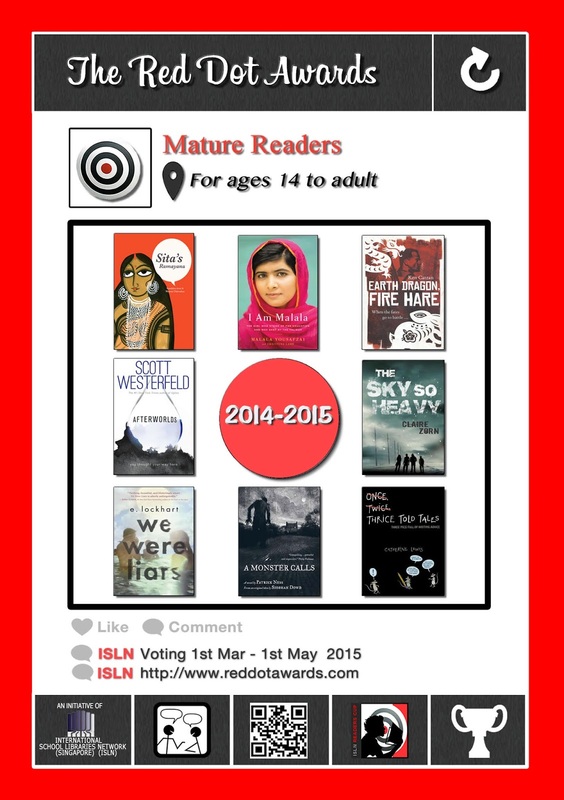 The list of books won't be announced until Red Dot voting is finished on March 12th -- as only 5 out of the 8 books in a category are used for questions. 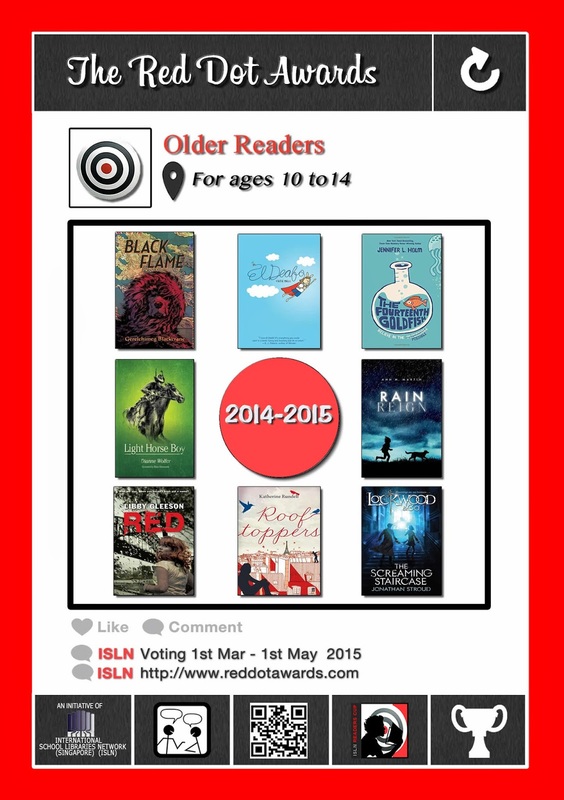 This is to encourage reading of ALL the Red Dot titles, not just the ones in the competition. See the Readers Cup page on the website for more info. If you are interested in being part of the working group developing questions for Readers Cup, contact Katie Day (kda@uwcsea.edu.sg). Red Dot voting starts in less than a month! From Wednesday March 5 through Wednesday March 12. Did you see how two of our Older Reader titles won awards from the recent American Library Association (ALA)? 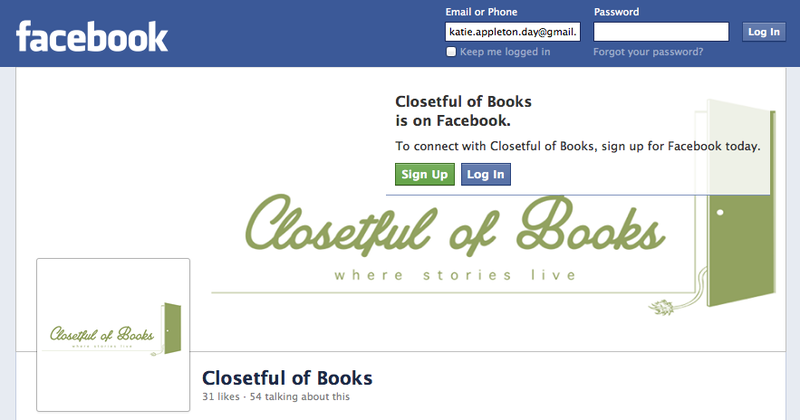 Denise Tan, formerly of Bookaburra, has started her own business called Closetful of Books. 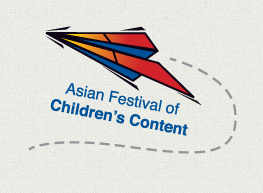 She's arranging authors visits to schools for the upcoming AFCC (Asian Festival of Children's Literature) in May. See list of authors (PDF) here -- they're available May 26-30 and June 4-6. Click here to read the minutes of the general meeting on February 6, 2014, at Tanglin Trust School in the junior library. Jacqui Makselon gave a detailed presentation on their three-year project to improve professional development opportunities for library support staff at Tanglin Trust. The next meeting is at UWCSEA East (Tampines) in the secondary library. 4:00 for 4:30pm start. This will be our Annual General Meeting (AGM).